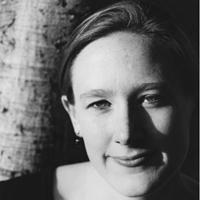 Sarah Ruhl is an American playwright. She studied under Paula Vogel at Brown University and currently lives in New York. Ruhl gained widespread recognition for her play The Clean House, a romantic comedy about a physician who cannot convince her depressed Brazilian maid to clean her house. It won the prestigious Susan Smith Blackburn Prize in 2004. It was a Pulitzer Prize finalist in 2005. Her play Eurydice was produced by Circle X Theatre Company. Ruhl is also known for her Passion Play cycle that opened at Washington’s Arena Stage in 2005. Other Plays include Orlando, Late: A Cowboy Song and Demeter in the City. In September, 2006, she won a MacArthur Fellowship. In the announcement of that award, she was described this way: "Sarah Ruhl, 32, playwright, New York City. She is a playwright creating vivid and adventurous theatrical works that poignantly juxtapose the mundane aspects of daily life with mythic themes of love and war."